It was a celebration of life befitting a man who spent his life in service in Portland. Several hundred people crowded St. Henry Church in Gresham on Wednesday, October 31 to say a final farewell to Fr. Jack Krall. Fr. Jack died on October 17 at the age of 82. 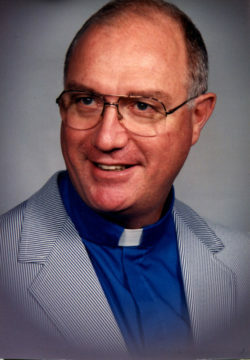 During his 55 years as a priest, Fr. Jack covered many corners of the Portland area, including teaching at Central Catholic High School, and serving the Portland parishes of St. Charles, St. Francis of Assisi, St. Rose, St. Joseph the Worker, and in Beaverton at Holy Trinity. But Fr. Jack holds a special place for the staff and board at The Northwest Catholic Counseling Center. He had a strong passion for social justice and commitment to the poor. He saw the need for mental health care in our area in the 1980s, particularly for those without insurance or resources. Fr. Jack was one of the original priests who helped pool resources to start the Center, and bring Sr. Barbara Kennedy, OSM, LPC and Sr. Sarah Deeby, OSM, LPC to Portland from Omaha, NE. Fr. Jack was committed to NCC until the end of his life, becoming one of the very first Faithful Friends – donors who give to the Center monthly, helping bring mental health care to anyone in need. We’ll miss his dedication, caring, and ever-present humor.